Picked mangoes are a great snack for any warm weather outing, whether its at the beach or a back yard BBQ. I was inspired to make this since the Mo's aunt and mom always makes this in the summer for the family gatherings. 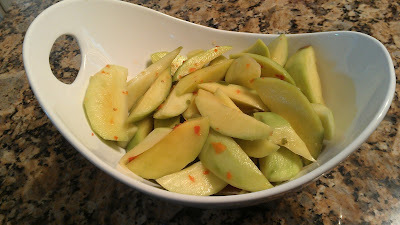 Unripe mango was on sale for $ 1.00 each at the Cambodian stores so I decided to make this delicious salty summer treat. I bought 10 mango and washed them and removed the thick skin with a hand peeler. I cut wedges of the mango trying to maximize the pulp by cutting around the big seed in the center. To make the chili paste, I mashed up 7 Thai Chilis in a mortar and pestle. You can definitely use more or less chili peppers based on your heat preferences. In a large mixing bowl, add the mangoes, chili paste, salt, sugar and msg. 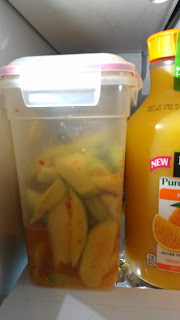 Put the marinated mangoes in an airtight container and fridge for a day or two then enjoy!